ATTICS | Brand Insulation Inc. Your home, even if it was built recently, may have insufficient attic insulation to stop excessive heat loss/gain. Brand Insulation can properly insulate and ventilate your attic to make your home more comfortable, reduce your energy costs and increase the value of your home. Talk to us. We can help. Brand Insulation installs InsulSafe XC® GREENGUARD Gold Certified, from CertainTeed, an industry-leading blown-in thermal insulation – an unbounded, white, virgin fibre glass. It delivers exceptional energy efficiency and thermal performance – which means a more comfortable home and lower energy costs for you. InsulSafe XC® is noncombustible, noncorrosive and odor free. In addition, it won’t settle, contains no chemicals to cause mildew and fungus growth, provides no sustenance for vermin, contains no formaldehyde, won’t rot or decay and won’t retain moisture. Want more information about InsulSafe XC®? Click below. Is poor insulation the reason icicles form on the outside of my house? Probably. If your roof is warm enough to melt the snow but it’s cold enough outside for the water to refreeze, your roof is losing heat. So when you see icicles forming on the outside of your house, it’s a good indication that you don’t have proper attic insulation and/or ventilation. My home is only a few years old. How could it need attic insulation already? Adding attic insulation isn’t just for older homes. 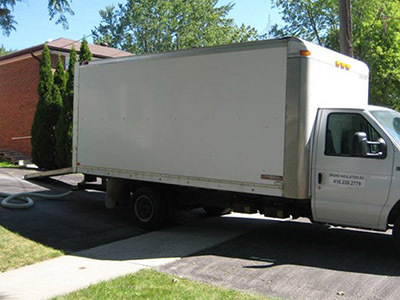 We see newer homes, some between 1-5 years of age that require the insulation to be topped up! There are several reasons this may be necessary. Building codes for attic insulation has changed over the years – from a the minimum R-Value of R32 in 2000 to a minimum R-Value of R50 today. In addition, sometimes builders under-install attic insulation to lower costs. So you may, for example, have a home built in 2000 with an attic R-value R15-20. Ventilation is important too. How do I know if my attic is properly vented? You may not know until it’s checked. While most newer homes have builder baffles (soffit vents) installed when the roof is built, sometimes sections of a roof are missed. Typically many older homes are not properly vented. Brand Insulation will carefully inspect your attic, advise you where/if soffit vents are needed, and install them before insulating with InsulSafe XC®. Why can't I install attic insulation myself? You can, but we strongly recommend that you contract the services of an experience installer who has the knowledge and equipment to do the job right the first time. The overall effectiveness of any insulation material is directly linked to the quality of the installation process. Brand Insulation’s trained, professional installers have more than 10 years experience, and we warranty our work. What is R-Value? And why is a higher R-Value important? R-Value reflects the ability of insulation to resist the flow of heat out of a building in the winter and into a building in the summer. A higher R-Value ensures more comfortable environment and greater energy savings. Current Ontario building code stipulates attic insulation to have a minimum R-value of R50. How long does it take to install InsulSafe XC®? Do I have to leave my home during installation? While it will depend on the size, design and construction of your home, the installation of InsulSafe XC® typically takes less than a day with little disruption or mess. 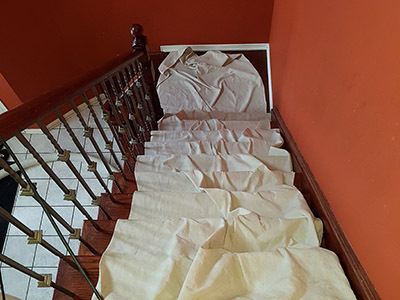 We protect the floors we walk on to reach your attic access and clean up any visible debris in your living space before we leave. You can remain in your home while the installation is being done. After InsulSafe XC® is installed, when will I have to insulate my attic again? When properly installed, InsulSafe XC® lasts for the lifetime of your home and requires no maintenance. 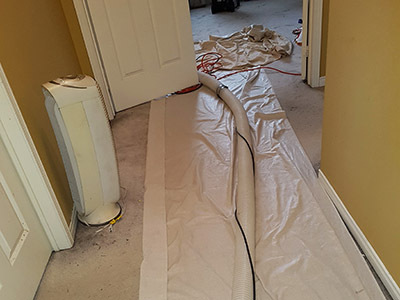 Brand Insulation’s installation process is so neat and tidy, you won’t know we were in your home. Until you get your first energy bill!